WE will focus on creating a vision board with inspirations, plans and goals. Immerse yourself in an environment full of incredible women & make a connection to expand your network. Our goal is to inspire, empower, grow, and unify women. 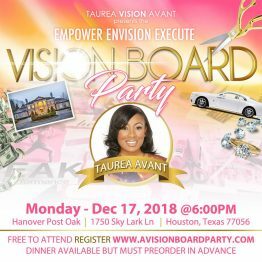 This is not like any regular vision board party. There will be a workshop as well where you will learn more about how to be specific with your goals. We are going to show you how to obtain your goals. How to create the best pictures to help you obtain success and more! If you’re passionate about PURSUING YOUR PURPOSE and bringing your VISIONS TO LIFE, join us! We will go over goal setting tips in the EIGHT areas of your life and how to truly use your vision board to change your life! SPREAD your dreams on your board and watch them come true! ALL Supplies will be provided, you are more than welcome to bring magazines or any supplies you want to add to your board.